The party says this follows ‘an underground unit of the ANC that has been violating our billboards’. The Economic Freedom Fighters (EFF) has written a statement alleging that members of the Johannesburg Metro Police (JMPD) are “going around and removing” the party’s campaign material. 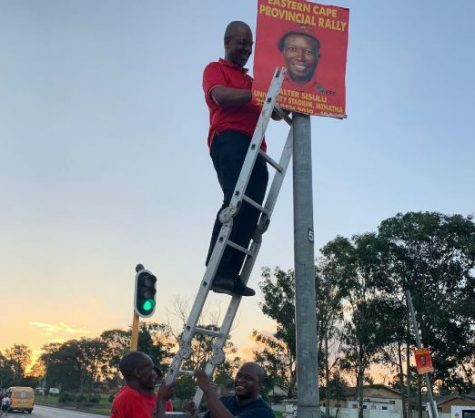 This, the party alleges, is not the only example of this taking place, with the statement also referencing “an underground unit of the ANC that has been violating our billboards”. Now the party says they have suffered “recent violence” from the JMPD through their alleged removal of posters. “The removal of EFF campaign material is a direct violation of our freedom of expression and rules of open, free and fair democratic elections,” the statement says. “The light-poles in the city cannot be the monopoly of private capital,” the statement continues. “During elections, society is interrogating multiple future options and discourse must not be suppressed in the name of some myopic City by-laws”. “We condemn the JMPD and call for their immediate disengagement from removing EFF posters in the city of Joburg”. “The EFF has all the rights to campaign freely without any intimidation and violation of its campaign material,” the statement concludes. JMPD spokesperson Wayne Minnaar, however, says the police were only doing their jobs. “The JMPD enforced City by-laws this past Sunday by removing the posters of three political parties from the on ramps and off ramps of Johannesburg freeways and from the main carriageway of freeways at Houghton, Marlboro and at Southgate,” he responded. “A meeting will be held in Johannesburg this Wednesday by the City of Johannesburg Chief Electoral Officer and representatives from all political parties, to discuss the procedures of display of posters for the upcoming election,” he added.